Caleb Nicholson (BSED ’09) helps others reach their full potential. Caleb Nicholson (BSED ’09) works as a talent acquisitions specialist for Chick-fil-A. Caleb supports Dawgs Suit Up scholarships, which provide financial assistance to students in need of professional attire for their first job interviews. Caleb’s career path began with an internship he secured through UGA’s College of Education. He serves as vice president of UGA’s Metro Atlanta Young Alumni Council. As a talent acquisitions specialist for Chick-fil-A, Caleb Nicholson has a passion for finding and hiring the best employees for his company. Today, he conducts interviews weekly, but he’s never forgotten what it’s like to be on the other side of the desk. That is why he gives to the University of Georgia — to ensure students are prepared when searching for their first jobs. Caleb supports Dawgs Suit Up, a partnership between UGA’s Career Center and JCPenney, which allows students to purchase professional attire at a steep discount. At the Fall 2017 event, 1,300 students were able to purchase a full ensemble – a suit, shirt, belt and shoes – for less than $200. Many students applied for financial help to attend the event and purchase their first professional outfit. With the support of donors like Caleb, the Career Center awarded 310 scholarships, allowing recipients to receive their suits free of charge. 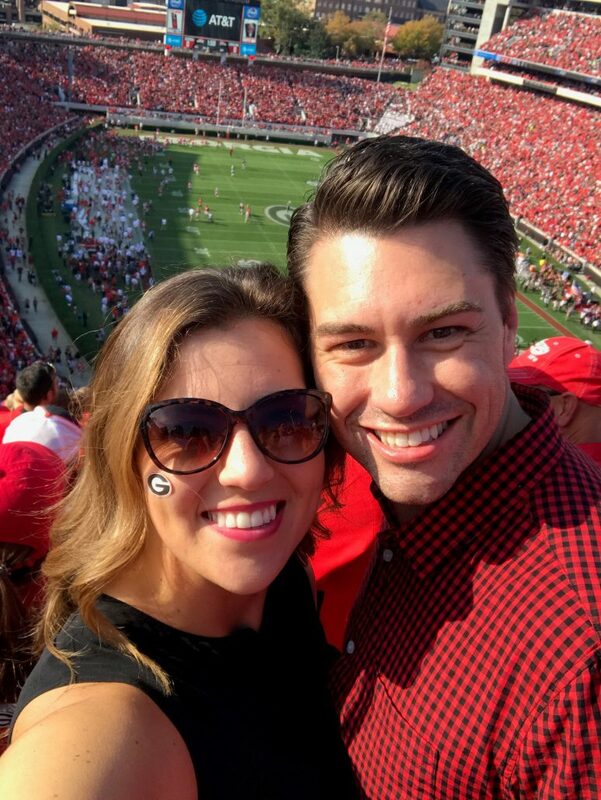 Caleb and his wife, Priscilla, cheer on the Bulldogs at Sanford Stadium. Caleb grabs a photo with Hairy Dawg during his recent visit to the Chick-fil-A corporate campus. Caleb’s career path began at Kiawah Island Golf Resort, with an internship he secured through his recreation and leisure studies major at UGA’s College of Education. Through this work, he learned how to bring his already strong passion for helping people into the business of hospitality by organizing and planning events for adults, young adults and children. “Working for the resort made me understand that I love to make sure that other people are taken care of,” Caleb said. Today, Caleb serves as a consultant for Chick-fil-A’s young talent development programs, helping colleagues follow the company’s hiring system and find the best candidates for various jobs. His daily schedule includes interviews, consultations and meetings with young employees to provide them with career coaching – one of his favorite aspects of the job. 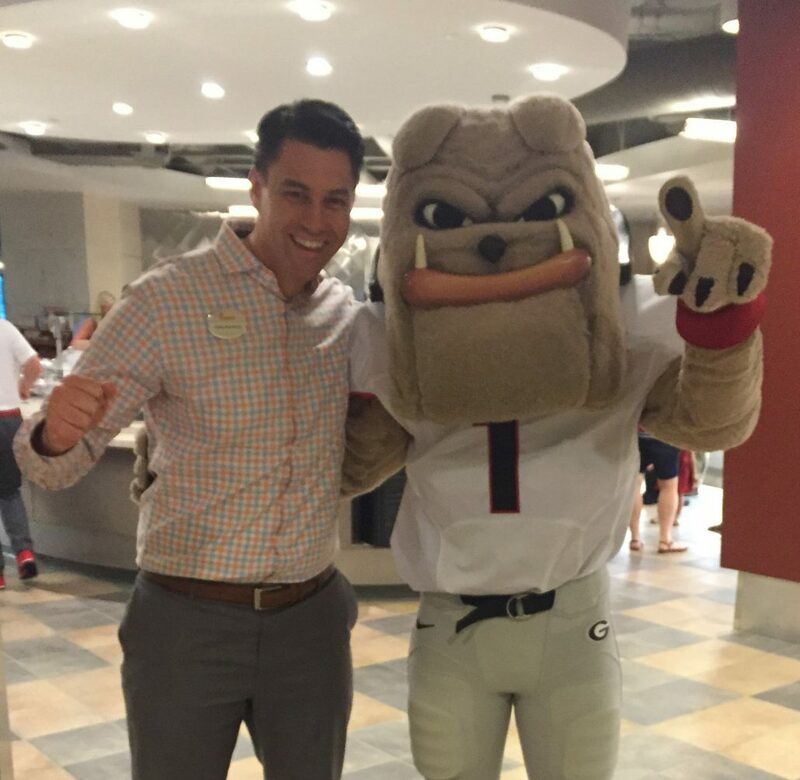 In addition to participating in the Chick-fil-A Alumni Chapter, Caleb serves as vice president of UGA’s Metro Atlanta Young Alumni Council, through which he helps alumni discover ways they can stay connected to the university. He will step into the president’s role next year.